It's beautiful in Portland today, but we need to get to the coast for the BBQ tonight. 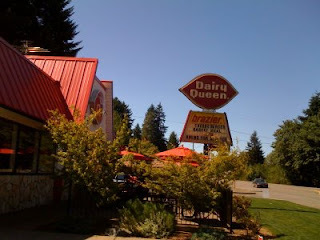 On our way we passed this Dairy Queen. And I've been craving a Blizzard. What luck! Darling I've always had suspicions there was something dark and satanic about Dairy Queen. In case you're shopping for my Xmas gift. . .
Did I mention the doughnut eating contest? Shannon says "Lunch or Voodoo"
We have arrived in Portland! He's Just a Brief Guy. It's What He Wears. One Man's Trash. . .
Congrats! You Just Had A Bouncing Baby. . .